Kelvin Brown has signed a one-year contract with Aurillac. Brown celebrates the famous win over New Zealand in June. AN IRISH U20 star who was omitted from the Munster Academy is poised to make his debut in France this evening. Back rower Kelvin Brown was a member of the Irish team which reached the World Rugby U20 Championship final against England in Manchester in June. By then he had been told there wasn’t a place in the Munster Academy this season, having been in the sub-academy prior to that. But the Shannon clubman refused to give up on his dream of playing professional rugby and this evening will take a giant leap in that regard if he comes off the bench for Aurillac away to Oyonnax in the French ProD2. Aurillac are coached by former Irish international Jeremy Davidson and are strongly bidding for promotion to the Top 14, currently level on points with Agen at the top of the table. Brown has been drafted in by Aurillac after a long-term injury to one of their back rows and the former Ardscoil Ris student jumped at the opportunity, signing a one-year contract. “I’m really looking forward to it. I’ve settled well in France and am delighted to get this opportunity, so I can’t wait for it to start,” he said. “The way I looked at it heading to the World Cup after being told I wasn’t in the Munster Academy was that this was an opportunity to showcase. “I turned a negative into a positive and said ‘This is my last chance. I’m on a world stage. It’s my last shot at getting a professional contract.’ I used it as a positive. Aurillac have made huge strides under Davidson’s direction and reached the play-offs last season despite having the smallest budget in the division. His six years learning French at Ardscoil Ris has helped Brown settle in the town with a population of around 27,000 in the Auvergne region of south-central France. “The language is a challenge but an enjoyable one. It’s kind of coming back to me as well. My vocabulary is there so it’s just being able to stay a few words. All the training is done through French. Jeremy does all the training through French. “I’m able to understand it because obviously it gets a bit repetitive. You’re doing the same drills so it’s easy to understand stuff like that. “Aurillac is a small bit smaller than Limerick. It’d be similar enough to Ennis I’d say. Rugby is the number one sport here and the stadium is full for most home games. It’s very enjoyable and I’m just hoping to make the most of it,” added Brown. His progress will be closely watched back home. His father Harold played for Shannon, continuing a strong family link to the club. “My nana, his mother, Anne Brown, would have cooked the stew in Shannon for years after the games. “On my mum’s side, my grandfather Billy O’Shea is a former Shannon president, while my uncles Ryan O’Shea, Billy O’Shea and David O’Shea all played for Shannon. I enjoyed my time with Shannon as well but this is a new challenge,” added Brown. Brown wasn’t the only Limerick player who went to that tournament having been told that there wasn’t a spot for him in the Munster Academy and Ben Betts from Shangolden, who featured for Young Munster in the AIL last season, was also snapped up and has since joined Leicester Tigers. 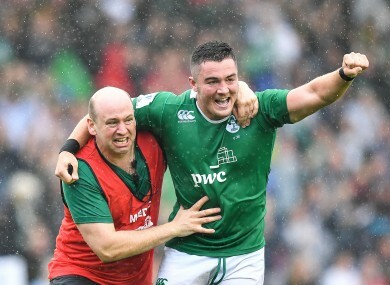 Email “Dropped from the Munster Academy, Ireland U20s star set for debut in France tonight”. Feedback on “Dropped from the Munster Academy, Ireland U20s star set for debut in France tonight”.